NEW YORK (Reuters Health) - A UK researcher has a new explanation for how the human race manages to keep a fairly even balance of males and females, despite massive deaths of young males in war and selective abortion of female fetuses in certain parts of the world. 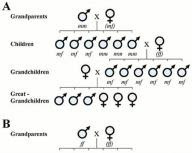 Corry Gellatly, a research scientist at Newcastle University, proposes that there's a gene that determines whether a man will father more sons, more daughters, or equal numbers of each. When females are in short supply, they have a better chance of snagging a mate, and are thus more likely to pass the gene for fathering daughters on to their offspring. And when men are scarce, they have a better chance of mating and passing along the gene for having sons. Full story: Evolutionary Biology, published online December 11, 2008.